“Your memoir … Is all of it nonfiction?” This question, posed to me by an interviewer from a college newspaper, reflects something important about our particular cultural moment. Our modern artifacts — books, movies, TV, newspapers — are increasingly assumed to be partially true (but not entirely), or somewhat false (in places, at least), or about as factual as can be managed without undue exertion. To attempt to impose a strict definition of true and false (“Novels are fiction. They are invented. Memoirs are nonfiction. They are accounts of factual events.”) is to be met with confusion, uncomprehending looks, blank stares. What’s perhaps more unnerving, though, is that we’ve developed very different kinds of emotional attachments to things that are false versus things that are true. 1. In the trailer for the upcoming summer movie, Abraham Lincoln: Vampire Hunter, our beloved sixteenth president is depicted wielding an ax in slo-mo against a hoard of vampires threatening to take over the country. Fans at WonderCon responded enthusiastically to action-hero-style scenes of a young Lincoln chopping up vampires and chopping down trees with equal gusto. According to the Hollywood Reporter, Seth Grahame-Smith, the author of the book on which the movie is based, “stressed how much research was done to make the movie as historically accurate as possible, despite the genre mash-up.” No, Lincoln didn’t really hunt vampires. But if he did, it would look exactly like this! 2. Teenage Mutant Ninja Turtles fans are apparently outraged by producer Michael Bay’s mention that the Ninja Turtles in his upcoming movie are “from an alien race.” “Making the turtles aliens would ruin everything,” protested Stuart Heritage of the Guardian, “their desire to be accepted, their bizarre late-1980s street lingo, their fondness for pizza. 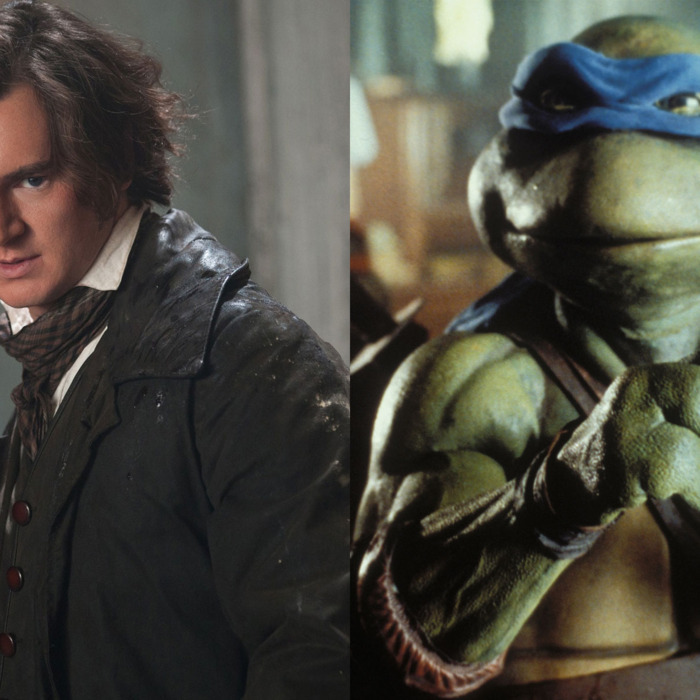 Everything.” Robbie Rist, the actor who played Ninja Turtle Michelangelo, accused Bay of “sodomizing” fans’ childhood memories. So let’s review: It strains credulity to alter the fictional history of cartoon turtles, but not to rewrite the history of an actual historical figure. Lincoln did wield a mean ax, after all. Why stop at exploiting that fact, and explore some other biographical details? Lincoln patented a device to free ships that had run aground (“Abraham Lincoln: Swashbuckling Pirate King” anyone? ), he loved to wrestle (“Abraham Lincoln: Dragon Wrestler”) and rode a horse named “Old Bob” ("Abraham Lincoln & His War Horse, Old Bob”). The possibilities for this franchise are endless. In contrast, Ninja Turtles are guided by strict rules and guidelines. They like pizza. They are not aliens. Your screenwriter is pretty much in a straightjacket at this point. Why even bother? Writers have certainly taken dramatic license with historical figures before, from Gyles Brandreth’s mystery series in which Oscar Wilde solves crimes to Andrew O’Hagan’s fictionalized account of Marilyn Monroe’s life as narrated by her little white dog. Even Grahame-Smith’s original leap from mashing up a literary work (Pride and Prejudice and Zombies) to injecting a historical figure into the vampire genre (Abraham Lincoln: Vampire Hunter, the book) doesn’t feel all that precarious. But once his book becomes a summer blockbuster and there’s our sixteenth president, slaying mythical creatures in full-color CGI on the big screen, some central “truthiness” alarm in the cerebral cortex is triggered. As compelling as the sequels might be (Bill Clinton: Satan’s Avenger, Gerald Ford, Homicide Detective, Jimmy Carter, Who Lives At Home), it’s tough to overcome the dissonance caused by watching a brawny Lincoln killing vampires, Buffy-style. The laws of physics, biological fact, recorded history: Today these things pale in the face of a story well told. Thanks to the intensity of the modern technological spectacle, our childhood attachments to pop cultural icons like Han Solo and Spider-Man and Rapunzel dwarf our attachments to even the most colorful world leaders and thinkers. “Lady Gaga is a real lady,” my 3-year-old said to me the other morning. I have no idea how she knows who Lady Gaga is or that her “realness” has been called into question before, but I didn’t tell her. I have told her who the president is and what country we live in and what planet we live on, but these facts don’t seem to stick in her brain as well as pop stars who dress like intergalactic warlords do. “A real lady?” I answer. “Yeah, she’s real. Sort of. Not really, though.” If President Obama wore a meat bikini to the next State of the Union address, he might seem more real to her than he does now. Just as public figures might be advised to dress in costume and speak like creatures from a distant galaxy to enhance their authenticity, true stories are often rendered more memorable when they’re festooned with whimsical fabrications until they sound just like fairy tales. Think of Mike Daisey’s gripping portrait, for “This American Life,” of the teenager who was injured in an Apple factory in China, tracing his mangled hand across an iPad, then declaring it “a kind of magic.” No wonder Daisey, who apologized to host Ira Glass in a follow-up interview, still sounded a little disappointed to find his inventions had been so cruelly scrutinized for accuracy. “We have different languages for what truth means,” Daisey told Glass. Unfortunately, though, his fanciful language of lies has the side effect of making listeners assume that conditions in the Apple factories aren’t all that bad. Or maybe Daisey means that no one ultimately cares what the truth is. With so much information broadcast in different ways to millions of different screens, with such a cacophony of interpretations and perspectives available, how can the truth fail to appear subjective? We increasingly scan the news the same way we scan the summer movie line-up: If no familiar faces or archetypes arise, then we can’t predict what shape the story will take, and we can’t invest. The violence in Syria, the murders in Afghanistan aren’t palpable or real to us. It’s easier to debate the value of adding 3-D to Titanic, or to speculate about the next Batman movie. The layers of invention inherent to brand-building, the layers of narrative suspense required to spice up the truth for a global audience, combine to make any attachment to the facts feel almost nostalgic, like the truth is a relic from some quaint but distant past. Even when we’re told the same facts, over and over, they don’t stick: Iraq had no weapons of mass destruction. The global economy was toppled by unregulated billion-dollar bets that few understood. We are incredulous. We can’t picture it. Maybe someone could make a blockbuster movie about it, and then we might begin to understand. There’s a scene in the Abraham Lincoln: Vampire Hunter trailer where Honest Abe is running across the top of a moving train as the tracks beneath it collapse into flames. The scene is shot from above, so you get a sense of the whole world dissolving into an inescapable, fiery void. Still, you don’t think, “Whoa, Abe is in trouble now!” You think, “This is a pretty cool use of CGI effects.” The truth – that even the biggest explosions of the 1800s probably didn’t look like hell opening up, that Abe Lincoln never dashed across a moving train pursuing vampires – couldn’t be further from the point. But that view into the fiery abyss, that long, steep slide into nothingness, that delirious sensation that every concrete, immovable reality could be erased in an instant? That part feels real.